Zenas Hsu (violin), was 13 when he won the Khuner Competition in 2004. 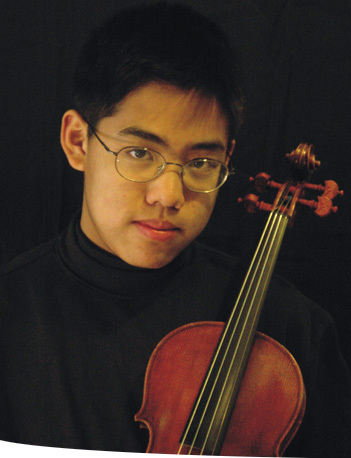 He began violin at the age of five, studying with Wei He at the San Francisco Conservatory of Music’s Preparatory Division, where he also studied chamber music with Susan Bates and Mack McCray. While still a teenager, he performed concertos with the California Youth Symphony at the Flint Center in Cupertino and at the San Mateo Performing Arts Center, with the Oakland East Bay Symphony as well as with Prometheus Symphony. In 2006, he was accepted by the New York String Orchestra Seminar at The New School. The seminar auditions young musicians, aged 15-22, in seven U.S. cities. Zenas was the youngest among the 62 national and international musicians chosen for that year. The orchestra so formed performed two recitals at Carnegie Hall. Admitted to the Curtis Institute of Music at age 16, he completed his Bachelor’s Degree at age 20, and holds a Master’s Degree and Graduate Study Diploma from New England Conservatory in Boston. Zenas performs extensively, having won several national and international competitions. An active chamber musician, he was a founding member of Zeffre String Quartet and of the Bay Area’s Chamber Music by the Bay. In Boston he was one of the youthful musicians who, in 2015, formed Phoenix (www.phoenixorch.org), a new chamber orchestra “aimed at revolutionizing the encounter with orchestral music,” which named him concertmaster.